This was the pre-show match. Unfortunately, this only went for a couple of minutes. Takahashi was in control in the corner throwing some kicks, then Briscoe rolled out of the ring. The referee checked on him and called off the match, declaring Takahashi the winner. It wasn't clear what happened from my point of view, but Briscoe ended up suffering a dislocated elbow. This was supposed to be Best Friends vs. The Addiction, but Christopher Daniels and Frankie Kazarian came out in their street clothes and said they weren't going to wrestle tonight. Titus and Ferrara replaced them, with Barreta eventually pinning Titus after Best Friends hit their combo finisher. This started slow, eventually going fairly long and getting hotter and hotter by the end. Lethal hit the Lethal Injection to get the pin. They both sold heavily after the match and shook each other's hand. Vinny Marseglia and TK O'Ryan represented The Kingdom here. The crowd went nuts when The Young Bucks made their entrance. The match had a lot of high flying, about a dozen superkicks, and Chris Sabin pinned Matt Jackson with a cradle in a surprise finish to retain. Purrazzo submitted Jackson with an armbar. The winner would have gotten a shot at the ROH World Television Championship if it wasn't King, but King won with two not-so-smooth Royal Flushes on Woods. Ray Rowe pinned Lance Archer after War Machine hit a double team backbreaker/knee drop from the top rope. - Bully Ray came out and gave an emotional speech saying he has a head injury and doesn't know if he'll ever wrestle again. He said he wanted to see the Pittsburgh crowd one more time if that was the case. Suzuki got a huge reaction, then had a fun match with Young. Eventually, Davey Boy Smith Jr. came back out. The referee was bumped, Smith Jr. interfered, and Suzuki hit Young with a chair and the Gotch-style piledriver to get the victory. 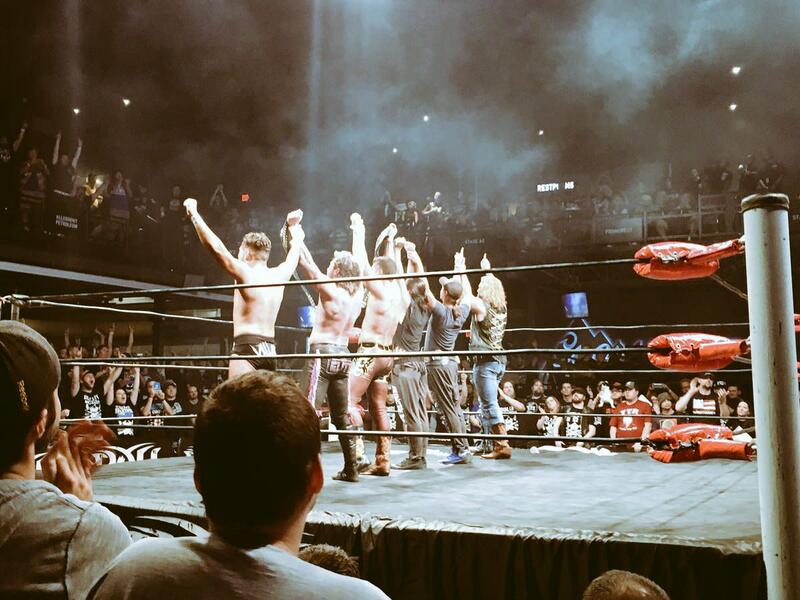 The Bullet Club said they were invoking the Freebird rule, or rather the Bullet Club rule, before the match and that this would be for The Young Bucks & Hangman Page's six-man tag titles. The match went about 20 minutes, with the crowd going absolutely nuts for it. The crowd was definitely there to see the Bullet Club, and there to see Omega in particular. The Young Bucks and Page ran in towards the end of the match, resulting in Scurll running Yano into all 10 boots of the Bullet Club in the corner. Scurll submitted Yano with the chicken wing shortly after. After the match, pretty much everyone stayed in the venue to listen to Cody and Omega's promos. They taunted WWE and thanked the crowd to close the show.